This teacher professional development course familiarizes educators with the RTI system for redesigning schools and possible implementation. RTI aims to meet the needs of struggling students through a pyramid of interventions. The course provides a practical RTI model for teachers, administrators and parents with clear examples of strategies to implement the RTI system components into a school setting. Educators will research the concept and results of the RTI system in districts nationwide. They will develop plans or activities for implementing RTI or its variety of recommendations for school improvement and reform. Educators will acquire an understanding of the basic components and philosophy of the RTI system and design for school for reform. 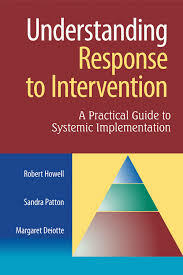 Participants will study the RTI Multi-tiered Interventions Model Pyramid that explains the intensive, targeted and universal levels of RTI best practices. Educators will be presented with solutions to address the root causes of student deficiencies and applications of RTI problem solving strategies. Participants will be able to use data and benchmarks for addressing special education issues and concerns along with RTI professional development needs. Educators will research the RTI system regarding its effectiveness in schools where it has been implemented and apply RTI concepts for use in their school district.